Unlike red, yellow is not a colour that I wear very often. I love it as a colour but finding a shade that flatters me is pretty tricky. I spotted this top in Warehouse a couple of months ago and I fell in love and thankfully the colour actually works on me. It is more lemon in person but it is impossible to photograph so you will just have to take my word for how nice a colour it is! Paired with my favourite skinny jeans and some shiny shoes, it was the perfect outfit for dinner and drinks. I love wearing lipstick but eyeshadow is still a bit of a new one for me so I have been trying to push myself out of my make-up comfort zone. I always feel a bit weird wearing really heavy eye make-up when it is still light outside (yes, I know it's a strange things to be bothered by!) so I opted for a soft brown/bronze look instead. It still looked like I had made an effort but I didn't feel too overdressed walking into town, win win! 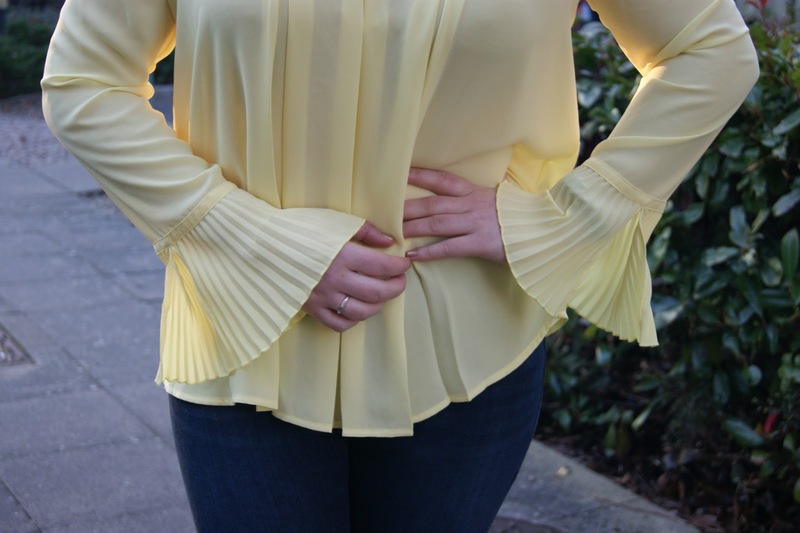 These beautiful pleated sleeves were my favourite part of this top, aren't they fun?! They are quite long though so I wouldn't advise eating messy foods with these because they will dip into absolutely everything! Shiny shoes will always be fun and this River Island pair are one of my favourites. Because they are flat they are super comfy and I can dance the whole night away in them. More proof that basics don't have to be boring! Are you a fan of yellow? How fun are these sleeves!? I think yellow looks wonderful on you and really suits your complexion. Beautiful! Who can resist a bit of glitter!? I really want a yellow dress but I'm not sure which shade will suit me. I have dark hair and pale skin too but seeing these pictures has convinced me to go ahead and take the plunge because you look lovely.